It's a very common practice in perl and linux/unix shell scripting to use an external configuration file (.conf or .properties), keeping all the script's necessary settings organised tidily in one place. This makes it easier to configure in the first place (because you don't have to hunt through the whole script to find what needs tweaking, or which environment variables need to be set), and also makes maintenance of the script so much easier (because you don't need to reconfigure after installing an updated script). For some reason though, this practice never seemed to get widely adopted in the Windows batch file world. Either Windows script-kiddies just never learned to think like a sysadmin, or we never expected the DOS shell to be capable enough! Or maybe we never bothered, because surely windows batch files should be extinct by now? Well, it is possible to take advantage of the elegance of external configuration files. For some time I've been using a technique that I adapted from what I'd normally do with perl and bash scripts. I'm sure this was invented decades ago, but it surprises me that I haven't yet found a good example or tutorial on the net. So I thought maybe time to polish up the "pattern" and share it here. It's pretty simple! The flowchart on the right provides an overview. A nice usability touch is that when the script is first executed (i.e. 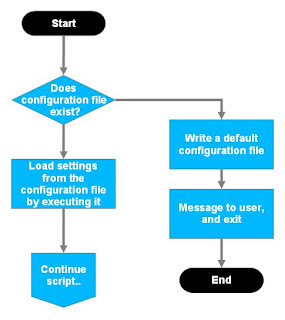 no configuration file present), it will generate a default configuration file, give the user some helpful instructions on how to edit the configuration file, and exit. This makes your script "safe" for users who are liable to run it just to find out what it does(!). But it also means that you can maintain the default configuration file structure - with as much built-in documentation as you like - inside the script itself (therefore only one file to maintain). Here's a script template that includes the configuration file handling (also available for download here). As you can see, not rocket science! If you have multiple scripts that all need to share a common configuration, you can extract the config file handling as a separate script and include (call) that from all the others. See the scriptTemplate.cmd and config.cmd in this kit of examples. echo # Local configuration not yet set. echo # A default configuration file (%LOCALCONF%) has been created. echo # Review and edit this file, then run this process again. echo The main script starts from here. Here's an example of running the script above. The first time through, no configuration file is detected, so it creates one and exits. At that point, the user could edit the configuration file if necessary. Subsequent runs pick up the settings in the configuration file. # Local configuration not yet set. # A default configuration file (scriptWithConfigTemplate-conf.bat) has been created. # Review and edit this file, then run this process again. The main script starts from here.